Excitement is in the air with Prom season coming upon us. Around this time last year, I was sharing with you the custom prom jewelry design process for Courtney's junior prom jewelry. Courtney selected Crystal Allure Creations for her prom jewelry and I was even more excited because her requested color was in the color family of my favorite color. If you recall, the design specs asked for sterling silver metal, however, to keep Courtney within her budget, we opted for silver plated metal. But, regardless, the final pieces turned out spectacular! The final pieces were elegant and included a crystal necklace, crystal drop earrings and I even surprised Courtney with a matching crystal bracelet! 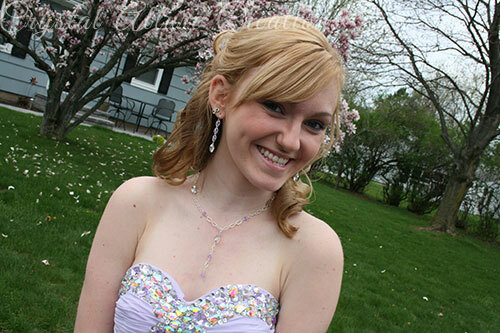 Courtney's Custom Lavender Crystal Prom Jewelry Set featured a silver textured chain with individually wire-wrapped Crystal Silver Shade Swarovski Cosmic Crystals paired with violet Swarovski Crystals. The mix of Swarovski Crystal shapes ended up being the perfect complement to her embellished dress. And here she is -beautiful isn't she?! The flowering tree behind the lovely couple created a beautiful backdrop for her prom pictures that will give her some great memories looking back at them. I believe the tree was a dogwood tree? There's more prom jewelry coming....just a month later Courtney had her boyfriend's Senior Ball and I created custom jewelry for that event as well.